Live a Colorful Life: Really Random: Everything from a giveaway winner, to a tutorial, to a racy picture! 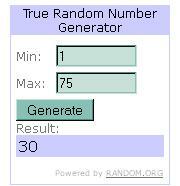 Really Random: Everything from a giveaway winner, to a tutorial, to a racy picture! First of all, I would like to thank the very gracious and generous Tammy from Marmalade Fabrics for offering a fat quarter pack of Citron and Gray fabrics when she played the Name Game on Monday. I love the combination of gray and yellow, but pale blue is a close second. Thanks for the chance!! You people love your gray, that's for sure! And you love it with lots of colors: yellow, pink, aqua, purple, turquoise, orange (yay! ), blue, deep mustard, deep maroon, fuschia, raspberry, burgundy, green, red, brown, teal. I have a solution for that too. 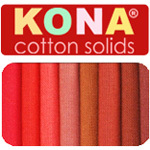 Tammy stocks Kona cotton solids in 143 colors! 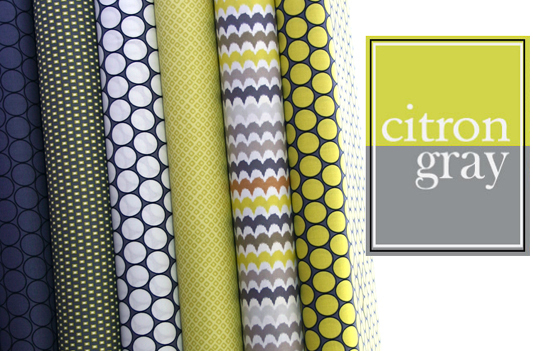 There is definitely the perfect shade, no matter what your preference is, to pair with gray. So go shopping! 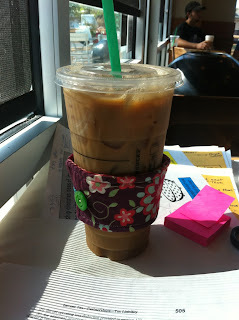 My friend, Valerie, who now lives in Texas, sent me this picture the other day, a coffee sleeve I made for her hot coffee, which she had to put on her cold coffee because of all the condensation at her local Starbucks. The weather is muggy there, y'all! We had "Midwest" weather today. My perfect kind of day. Rain. Pure bliss. Someone (and you know who you are...) actually called me "weird" because of that. I am someone who gets bored with sunny weather here in central California, really--days and days of sun with no break. Monotonous...so I had to take pictures. Although it had been raining most of the morning, about 12:30 a gusty storm really blew through. The house across the street. You can't tell (mostly because this isn't a video...) but the wind was really blowing!! See there on the right--it even blew over the garbage can. Our backyard (fast shutter speed). And then he gives me this smile and says, "Grandma, I love you more than chocolate pudding." So the other day I spent a good hour working on my 1/4 inch seam. I really thought it fine, there was a piece of tape on my sewing machine marking the spot and things seemed to be fitting together pretty well. Most of the time, at least. But I've been spending a lot of time with Farmer's Wife blocks, and some of those suckers have way too many little pieces. And then a new book by Judy Martin arrived in the mail and there was a tricky block in there that I really want to try. She had a paragraph on checking to make sure you have an accurate 1/4 inch seam, because "the right seam allowance makes everything fall into place." Hah, I thought. I'll follow her instructions and move on because I'm pretty confident of my 1/4 inch seam. Rotary cut nine 1 1/2" squares and a 1 1/2" x 9 1/2" rectangle. Join the squares end to end. Press seams to one side. Place the rectangle and squares face to face. If the rectangle turns out larger than the seamed squares, your seams are too deep. If the rectangle is smaller, your seams are too shallow. Measure. Adjust. Move tape. Try once more. Cool gadget that has holes. You put your sewing needle down through the hole and then you can lay down your tape in the proper place. Forgot I had it--glad I found it because it turned out to be accurate. 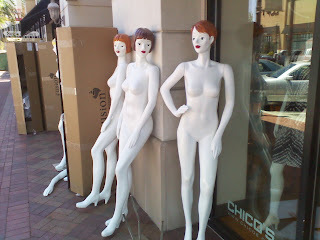 WARNING: Okay, if you do NOT want to see the "racy" picture, then now is the time to move on to a different blog. Actually, Mark, my driveby-shooting husband, who tends to take pictures of assorted interesting things, usually while driving (ahem....), sent this picture to my iPhone not too long ago. He was just driving through the parking lot of the shopping center, turned the corner, and these were all lined up outside the Chico's store! I love the look of your Sew Perfect Gauge. Can I have some more info on it please, I think I would love to have one of these. Lol!! Love the racy photo!! Congratulations to Mimi - have fun with your winnings! 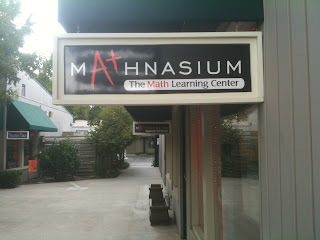 I love maths and the rain - the two together would be a perfect combination! 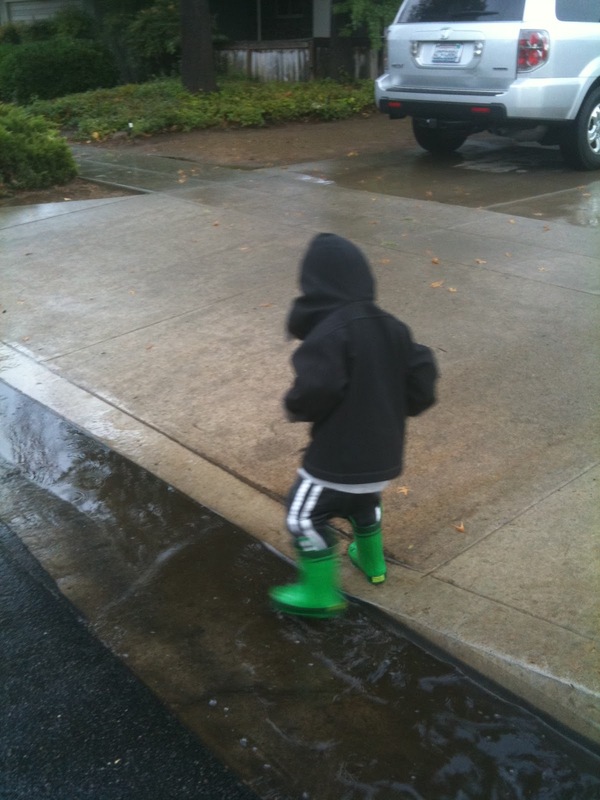 Love the 'puddle jumping in wellies' photo of Levi! Oooh a gadget. And its purple! Hhahaha awesome. Great really random Cindy! I think I am going to check my seam out! I like the gadget too, useful and better than shoving a quilt ruler underneath- funny last shot too! All I can say is 'feet with built in heels'!! A man must have designed those! Nothing like a good storm,a child saying they love you more than chocolate pudding and some naked ladies!! Yeah, that seam allowance thing. I just started trying a new way to sew my 1/4-inch and it's not as accurate as I used to (all my blocks were too small). I made do on this quilt, but thinking I need to get a gadget like you and get it right! I need to find one of the Sew Perfect gauges! What a great gadget! The Racy Photo is hilarious! I once pulled into the local grocery store parking lot and there was a girl changing her shirt right there in the parking lot. She stood by her car in her bra pulling on a different tee shirt. She had the "sense" to park out away from the front of the grocery store - but right beside the busy main street of town! I am thrilled to have won the FQ bundle!! Already dreaming of ideas for things to make. Thanks!!! To be loved more than chocolate pudding...such high praise!!!! I always use a sleeve for my iced coffee from Starbucks too!! Congrats to the winner! I love the gauge! I'm with everyone else--where do we get that? Just at the local quilt shop? And the racy picture? Hilarious! 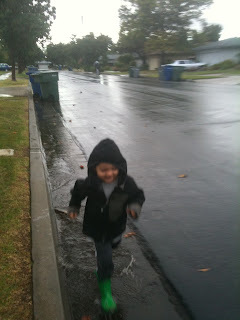 I can't imagine who would be so obnoxious as to call you weird because you like rain. The elixir of life. The water gift from the gods that falls EVERY DAY FOR 6 MONTHS where I live. It's possible that I'd like it to, if there was the promise of sunshine after every shower...I'll give you that! Figures Mark would have to take a pic like that. I wonder why he didn't send it to me!? P.S. Love your little puddle jumper! And rain... what's that?! Great gadget... But I have to tell you....I am sitting in the bar at my hotel reading this on my iPad and laughing out loud! I am not sure she will bring me a second glass of wine! 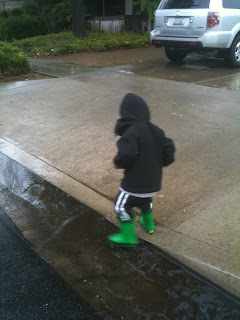 I would never call a fellow rain-lover "weird" so I know it wasn't me! I know my ¼" seam isn't that accurate. It's getting better, for sure, but it's not there yet. I love your random posts and thought about it earlier today...looked forward to what randomness I would find. You did real good! Now, I guess I better go check my seams....they ain't right, I know! !